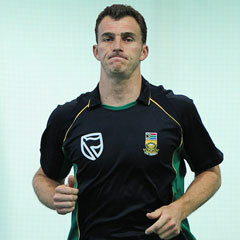 Johannesburg - Knights All-rounder Ryan McLaren has been recalled to the Proteas' Test squad as cover for injured players Jacques Kallis and Vernon Philander. McLaren, who has played one Test for South Africa, would link up with the squad ahead of the third and final match against Australia starting in Perth on Friday, Cricket SA selection convenor Andrew Hudson confirmed on Sunday. "There are injury concerns around both Jacques Kallis and Vernon Philander, so we have specifically gone for an all-rounder as a like-for-like replacement," Hudson said. "Ryan can comfortably bat at number seven in addition to his seam bowling skills." McLaren, 29, will leave for Australia on Monday evening. In his only previous Test, against England at the Wanderers in January 2010, McLaren contributed an unbeaten 33 in South Africa's only innings and returned match figures of one for 43.